This interesting colour film from Okinawa has been made available on You Tube. 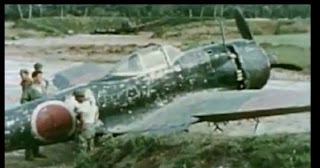 It largely speaks for itself but the Ki-43-II Kai was landed in error on a captured airfield by a ferry pilot who was promptly shot dead by US troops. The colour scheme does not appear to be new and may have originally represented a dense mottle of two greens. In addition to the white 'senchi hiyoshiki' so-called "combat stripe" the aircraft has a single character painted on the fin that may represent the ferry pilot assigned. Note deep dull red appearance of the national markings with white-bordered fuselage but plain upper wing Hinomaru - or is that a very narrow white border on the starboard wing? 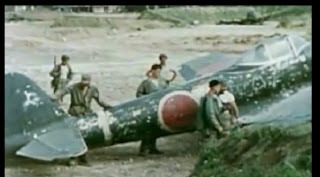 The 55th Sentai Ki-61 appears to have a blue spinner cap and sentai-hombu "sash" on the upper rear fuselage with the tail insignia in red. I suspect the undersurfaces may be painted with a thin application of light blue-grey. 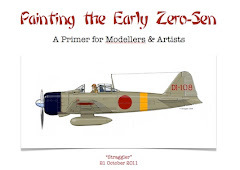 Modellers of the "matt brick-red" prop school take note of the appearance of the prop colour. 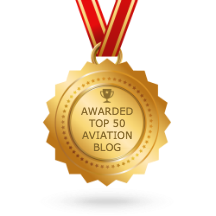 Try as I might I cannot detect the supposedly "Mitsubishi factory finish" of brownish "olive grey" on the Ki-51! 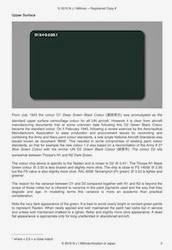 It looks like the typical blue-green 'Hairyokushoku' (JAAF paint standard #1) identified by so many sources with a tidy mottle of dark green blotches applied. 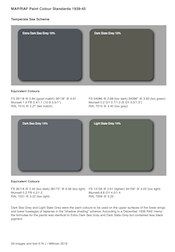 Compare the appearance of the paint to the dusty khaki "olive grey" of the oil drum. Obviously we need a 65-years old bit of painted tin to prove that what we think we are seeing is actually the brownish, yellowish "olive grey" of the factory finish. 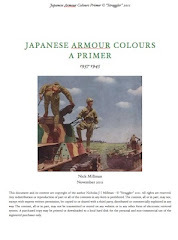 The colour as it appears in the film is deeper and stronger than most grey-green hobby paints but that accords with my own original and factual research and is consistent with the colours as identified by Thorpe. More on 'Hairyokushoku' in due course. 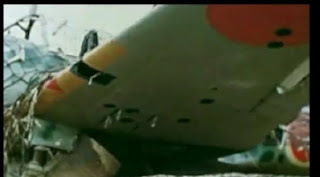 don't the multiple exhausts and the bulge for the 13mm make this a Ki-43-III Otsu? Anonymouse - I think you need to take another look at whatever references you are using! 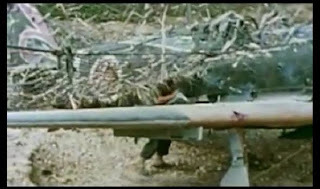 The aircraft has the single upper exhaust of the II Kai and the guns were 12.7mm anyway! The III Otsu prototype was not used operationally and had 20mm cannon! 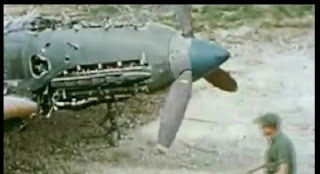 What about underside color of this Ki-61? It looks grey - is it painted or it is unpainted aluminium?